John Krasinski gets Navy SEAL ripped for his latest movie, 13 Hours: The Secret Soldiers of Bengazi. 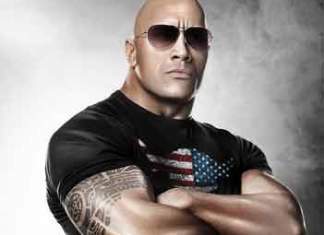 The goal of his workout is to become a tough, military figure. His current image doesn’t strike fear in many people (except Dwight Schrute). Known as Nice Guy Jim Halpert from The Office, a Navy SEAL character doesn’t immediately fit his profile. 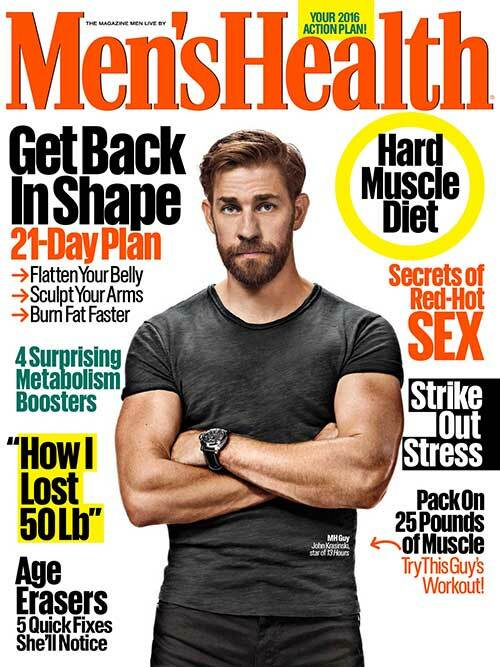 So, John Krasinski had to get in shape quickly for his new role. Only having 16 weeks to transform his body, Jim from The Office knew his workout routine was going to be tough. Luckily, he had the weekends off. Also, he was allowed to take one day off during the week. 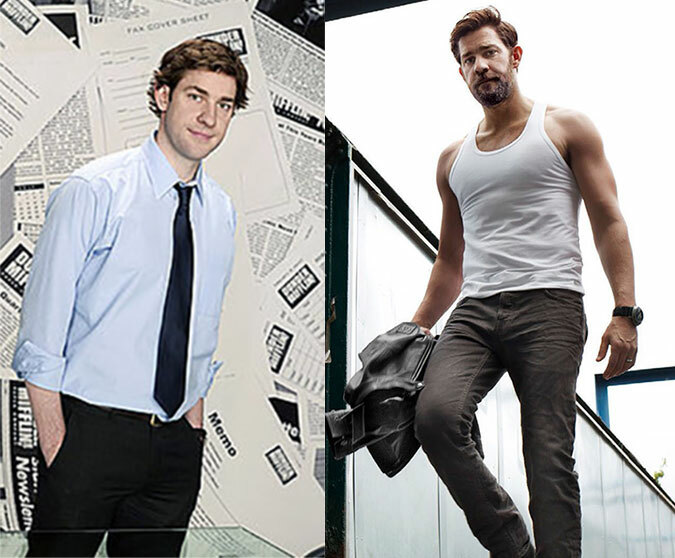 John Krasinski gave Men’s Health the “jist” of what each workout looked like. It’s a Weights-Abs-Metabolic Routine. Here are the primary exercises John Krasinski used. The routine uses a pyramid style of lifting. The goal is to go heavier in weight, but do less reps, each week. The aim is to use a heavier starting point the next month. The theory behind the pyramid technique is progressive load. After 4 weeks your body adapts to a heavier load. Being able to lift more, means stronger muscle tissue formation, leading to bigger muscle gains. Follow up each workout up with a core routine and metabolic activity. Core routines are different sets of abs exercises done each day. Metabolic activity included box jumps, sled pulling, kettlebells, rope pulling and (more below). One exercise I hate is anything with legs. If your triceps or biceps go, and you can’t lift the shampoo bottle in the shower…that’s funny! But, not being able to sit down at the table…that’s not funny! I didn’t know what I wanted, until Jason told me what it was. I realized the goal was to look like the guys you’d want to saving you if you were in trouble. Ditching the Jim Halpert character is what he really wanted. He had to become the real-life Navy SEAL Jack Silva. Getting rid of his fictional character’s persona was his workout goal. This meant adhering to a set workout schedule that included a lot of metabolic activity. Priority One was building up a strong foundation again. We accomplished this the usual way with heavy squats, presses, pulls and rows. I’ve gotta be honest. Those were brutal times. We did tons of metabolic work, dragging sleds and all the stuff I’ve seen NFL players do. The goal was to pack 25 pounds of muscle on John’s 6’3″ frame. They also had to reduce his body fat. Walsh first measured his body fat at 26%, 5x what would be allowed for a shirtless scene in a movie. For 13 Hours, John got down to almost 5% body fat during the shirtless scenes. So, how did they accomplish both adding muscle while burning fat? I had shoulder and back pain. in fact, I couldn’t even do one pull-up! His trainer wanted to build on a solid foundation. 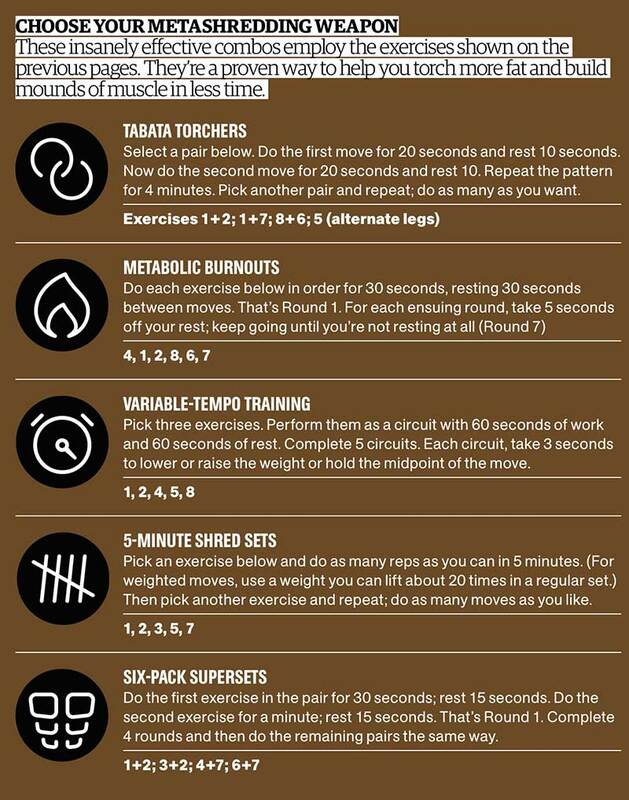 To develop dense muscle tissue, Walsh had him do the same 3 exercises at the start of every workout. Pull-ups were one of these high-frequency exercises Krasinski did constantly. Focusing on compound exercises, they built a solid base. Doing a lot of cardio, allowed him to show the 25 pounds he gained for the movie, 13 Hours: The Secret Soldiers of Bengazi. Getting stronger every day is thrilling! To be able to do 20 pull-ups every day…That was amazing. John started out not being able to do a pull-up. By the end of 4 months, he was able to do 20 each day. 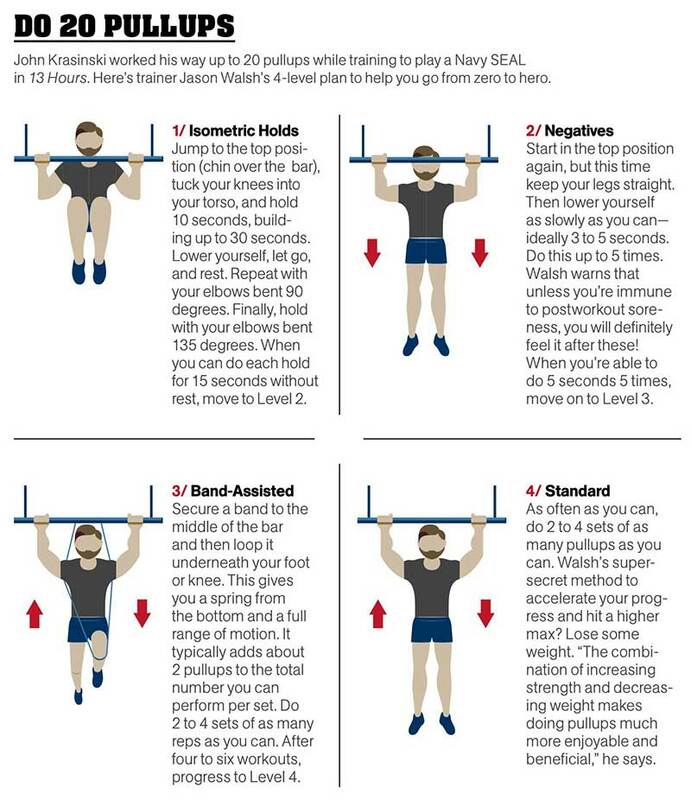 Jason Walsh shared a “how-to” with Men’s Health, on how to get better at pull-ups. 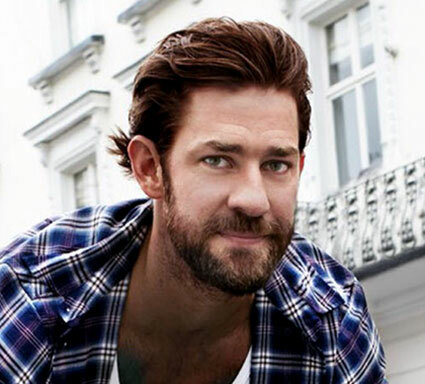 While enjoying a trip to Cabo San Lucas, John Krasinski realized his real life was too much life fictional Jim’s. He was enjoying all-you-can-eat buffets his TV character would probably love. But, in the real world, he wanted to pursue a tougher, more masculine set of roles. Much like Chris Pratt changed his body, John Krasinski wanted to follow suit. I went for it. Oh, it’ll all turn into muscle. I didn’t really understand the science. When Jason Walsh got control of his diet things changed. Krasinski realized what types of food are good for the body. Timing is also important. It’s important to replenish your body with carbs and protein right after a workout. If you don’t, you’re likely to see those gains erased because your body doesn’t have what it needs to grow new muscle tissue. One thing you’ve got to when you’re on the Men’s Health Cover: Ask for the ‘Chris Hemsworth Filter.’ Whatever they do to make him look the way he does on the cover…Do it to me! Don’t be afraid to reach out and grab the life that you want. There’s so many ways you can express yourself. Nice write up and appreciate the details but lacking in diet details. I believe the food puts into one!s mouth, the qty and timing, are as equally important to the weights workout details. Have any more to add?